If I were to run, I'd run as a republican. They're the dumbest group of voters in the country. They love anything on FOX News. I could lie and they'd still eat it up. I bet my numbers would be terrific. Is this an actual Trump quote, or is it made up? It then discusses many examples of Trump talking politics in 1998 and 1999, and they're all fairly incompatible to what it says here, in tone and content. 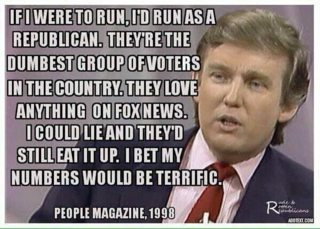 Notable about the image's apparently spurious Trump quote is its purported reference to Fox News in 1998. While the Fox News Channel was rolled out across major American news markets between 1996 and 2000 (and thus isn't entirely chronologically out of place in a circa-1998 quote), the network wasn't nearly as prominent or widely watched until the 2000 election of George W. Bush, the September 11th attacks in 2001, and the start of the Iraq War in 2002. Before that time, although Fox News was making its way into living rooms across the United States, it was not exceptionally well-known (or particularly regarded as a right-leaning outlet) in 1998. The photo in this particular version of the image appears to be taken from an interview with Oprah from 1988. He does discuss the idea of running for president in this interview, but the tone couldn't be more different: he's remarkably measured and complimentary about the other candidates. Not the answer you're looking for? Browse other questions tagged united-states politics quotes donald-trump . Did Donald Trump say this about Republicans? Did Donald Trump ever say illegal immigrants should have a path to citizenship? Are 41% of Donald Trump supporters in favor of bombing Agrabah (the country from Aladdin)? Did Hillary Clinton say this quote about Donald Trump and equal pay? During the presidential campaign, did Donald Trump say he'd require all Muslims to register in a database? Did Donald Trump say this about his daughter and wife? Did Donald Trump say that the law allowing a baby to be born from his or her mother's womb in the 9th month is wrong? Did Trump say “going loco”?